The royal wedding…or a royal wedding, at least, happened this past weekend, and I was alarmed to find out that more Americans watched it on television than British people. I guess ceremonial pomp and circumstance is old hat in the United Kingdom, what with their changing of the guards at Buckingham Palace and Interring of the Youngest Duke in the walls of the Castle of London being common, regularly-occurring events. I wonder how John Constantine would have handled it? I imagine he’d smoke a Silk Cut in church and be summarily kicked out. 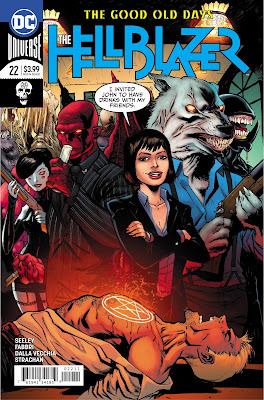 Let’s see what he’s up to now, in The Hellblazer #22, my review for which commences below! I like to see when people commit random acts of kindness, because we human people piss people off and ruin others’ days without even knowing it. A tight turn at the corner might spray a puddle onto a crowd of pedestrians. We might take the last chocolate babka at the bakery without knowing that someone else intended to get it. These little grievances aren’t the end of the world, but it is still regrettable when we’ve made an enemy without even trying. John Constantine doesn’t really have the same problem, because he has made plenty of enemies completely on purpose. And not just human enemies, but those from the paranormal realm as well. 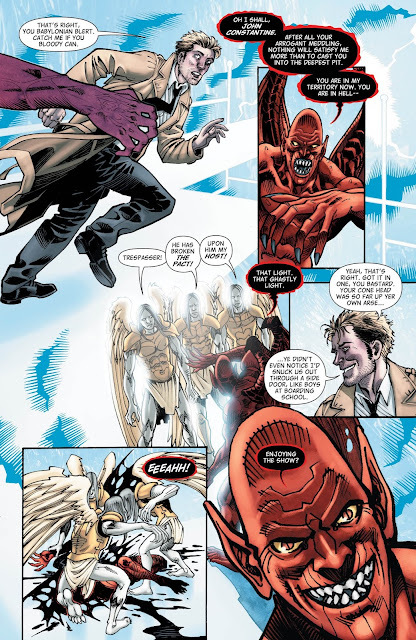 Demons, fairies, genies—all of them just can’t stand John Constantine for some good reason or another, and yet he gets to walk around on the planet Earth a free man, like everything is tickety-boo. This is how the demon Nergal, who was once dispatched by a bunch of angels thanks to John, discovered the plan to resurrect the damned souls of the villainous Day clan into the bodies of unfortunate bloke. One of those unfortunate blokes was Margaret Ames, who was infected with…multiple demons, I guess? And Nergal hoped she would seek Constantine’s aid, thereby springing Nergal’s trap on him directly, but Ames wound up chatting with Priest Day, bringing her to the current predicament. 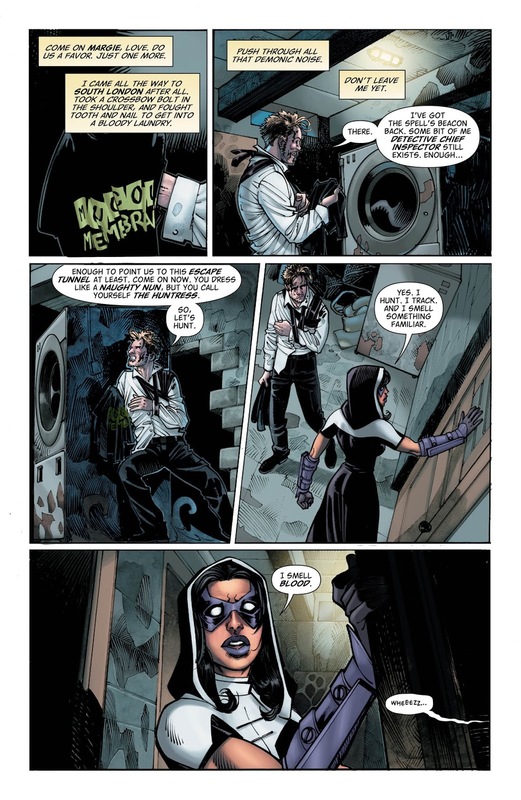 Which is, to be specific, a gaggle of Constantine-hating demons wriggling within her body, trying to get through the same doorway at once like something from a Three Stooges short. No matter: Nergal will simply bide his time and send more demons through Margaret Ames, so when they attack John it will be even more delicious. 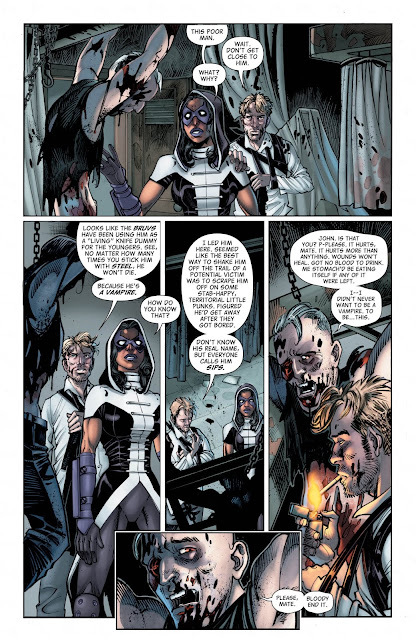 Speaking of John, he’s hanging out with the Huntress, who tells him her life story for some reason. Thing is, I don’t know that we’ve ever heard it before, so this acts like her secret origin, of sorts. Still running from that horrible gang, they find a vampire…you know what? This whole scene is just stupid and pointless. I don’t even want to describe it. The vampire is saved before all is said and done, and by “saved” I mean “murdered,” but at his own request. And now…another Day brother is resurrected? I have no idea what is happening in this book anymore. That’s the problem, really. 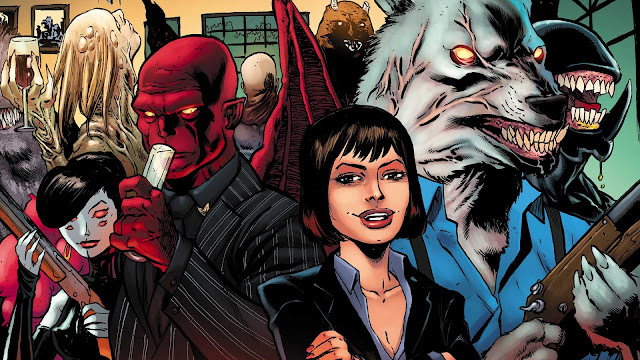 I have either spaced out on the story, or have grown so disinterested that I am not making any of the obvious connections between the resurrection of this Day family, and the demon Nergal’s spiteful personal crusade against John Constantine. I just don’t care about any of it. And while the renderings are just capable, there’s nothing obviously wrong with the plotting, so I’m not missing any part of the narrative. I think it’s just meandering and dull and I stopped caring about most of it two issues ago. Besides tracking Ames through an old t-shirt, Constantine does no magic and I’m still not sure why the Huntress decided to pair up with him in the first place. This whole arc is like a tub of honey rolling downhill. And we’re two towns over, only hearing about this sticky deluge second-hand. 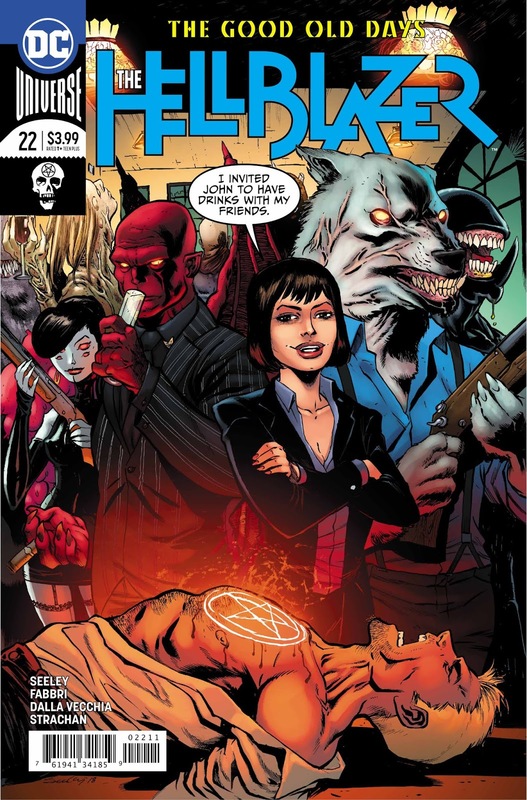 John Constantine and the Huntress continue to be nowhere near the relevant action, as a demon chats it up with some souls about how much he hates John. Essentially, another placeholder issue in a bloated, six-issue story arc. Sigh.